The Nibok refugee settlement on Nauru. SYDNEY — The Australian Parliament on Wednesday narrowly passed legislation that would let some asylum-seekers being held on remote Pacific islands come to Australia for medical treatment, a blow to Prime Minister Scott Morrison, who had strongly opposed the measure. Under Australia’s offshore detention policy, asylum-seekers who try to reach the country by boat are barred from ever settling there. 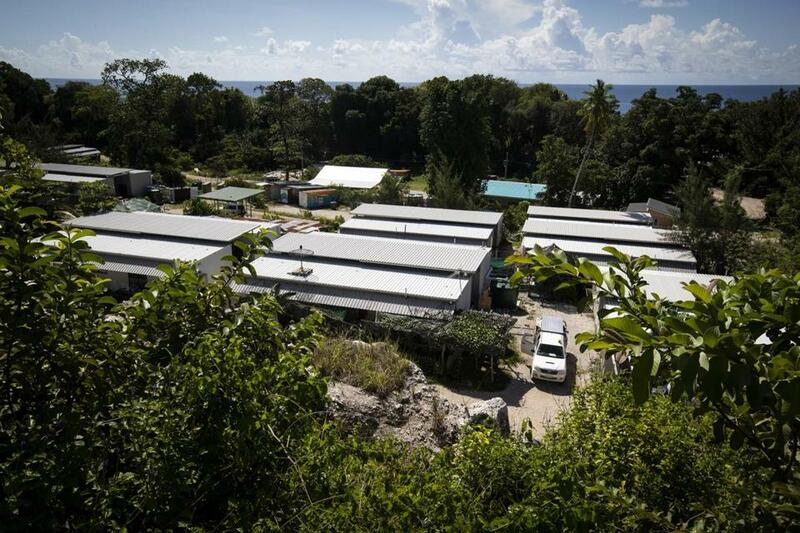 About 1,000 migrants intercepted at sea have spent years on the tiny island nation of Nauru or on Manus Island in Papua New Guinea, under conditions that visiting experts have described as dire. The detention policy has been condemned by the United Nations and various human rights groups, and Australians who oppose it celebrated the 75-74 vote in the House of Representatives on Tuesday and 36-34 in the Senate on Wednesday. Morrison’s center-right governing coalition lost its single-seat majority in the House last year, and the vote Tuesday appeared to be the first time since 1941 that a government had lost a vote on legislation in that chamber. With elections expected in May, Morrison’s coalition is trailing the opposition Labor Party in most polls. Medical experts have described the situation for the detainees on Manus and Nauru as nearing a crisis point. This month, the government said that all child asylum-seekers would leave the detention center in Nauru, after doctors said that children there were showing signs of extreme withdrawal from reality. Since 2014, 12 people have died in the offshore detention centers. In 2018, a coroner ruled that a more timely medical transfer could have prevented the death of Hamid Khazaei, an Iranian asylum-seeker detained on Manus, from a leg infection. But Morrison’s government says the detention policy has saved lives by discouraging asylum-seekers from trying to make the dangerous sea voyage from Indonesia. Before the policy was introduced in 2013, overcrowded boats often capsized while trying to reach Australia. Morrison, a former immigration minister, said he would reopen a detention center on Christmas Island, an Australian island territory, to address the prospect of future arrivals. He said he would also press for tougher national security steps in response. His government argued that the bill was a step toward ending the detention policy and that some of the asylum-seekers would be a security threat if allowed into the country. The legislation that passed Tuesday included a number of amendments added to assuage such concerns. It says that asylum-seekers and their families can be brought to Australia for medical treatment if two or more doctors say it is needed. But the home affairs minister can reject the request. An independent medical panel would review that decision, but the minister can still refuse the medical transfer on national security grounds, or if the asylum-seeker has a serious criminal record. Morrison said the vote showed that the Labor Party could not be trusted with Australia’s security. The Labor Party backed the medical transfer legislation but supports the broader offshore detention policy.